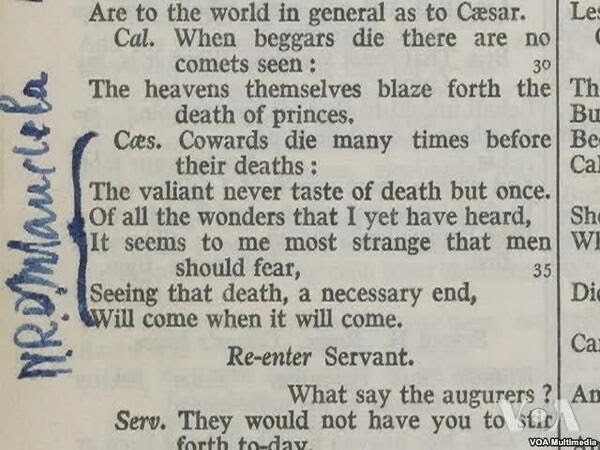 On the day the world remembers Nelson Mandela, it seems appropriate to publish this translation into Tibetan of some lines from Shakespeare’s Julius Caesar (act II, scene II) – the very lines that Mandela highlighted in the so-called ‘Robben Island Shakespeare’ on the 16th December 1979 during his long period of captivity. The translation was made several years ago by Kelsang Lhamo (aka Chödzin), a writer and now senior librarian at TBRC, when we were working together in New York on the translation of Sogyal Rinpoche’s Tibetan Book of Living and Dying into Tibetan – a project that is only now nearing completion. This entry was posted in Shakespeare and tagged Shakespeare, Tibetan on December 6, 2013 by Adam.